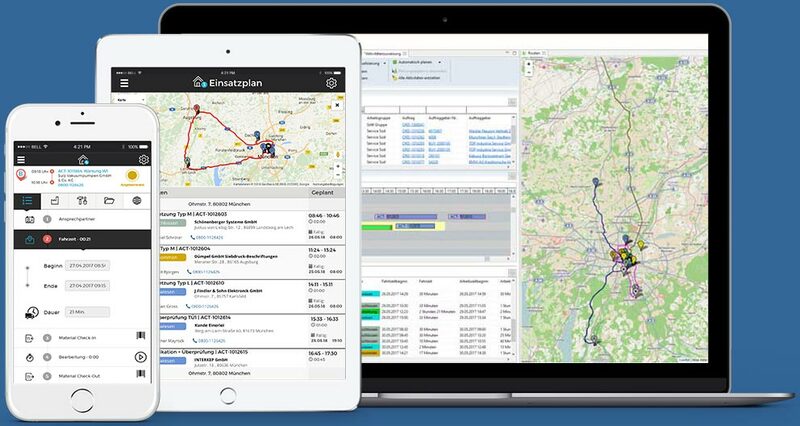 Field service mobile solutions in one FSM App powered by real-time data. Learn how your service technician's productivity can increase with an intuitive and easy-to-use field service app. Let us be the mobile field service solution for your team! Which professional field technician would refuse to go mobile? Which would prefer not to be in control of their work, and wouldn’t want to work easier and smarter? We know that no field technician or field service business who strives for operational service excellence would. That’s why, fortunately, eFLEXS field service management software for scheduling and mobile app are designed for simplifying and optimizing the scheduling of field service management and thus helping technicians execute more efficiently their work on the field. 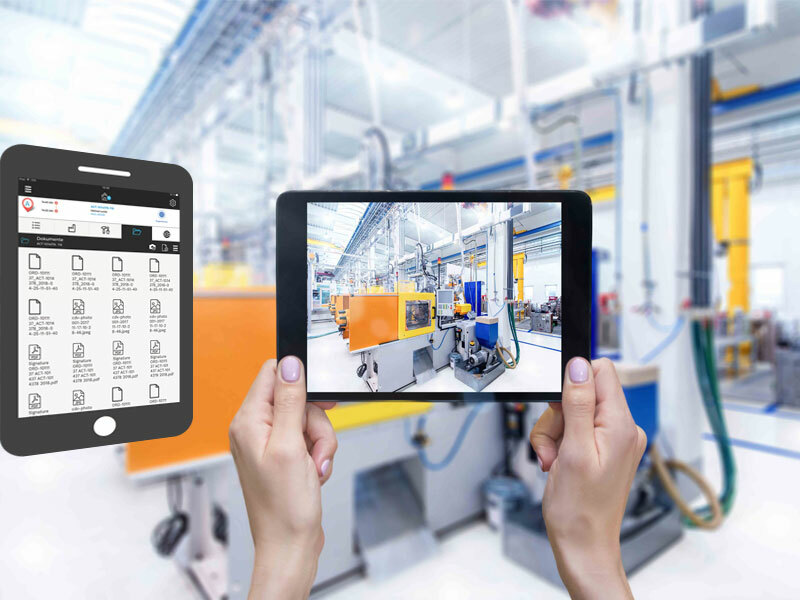 Integrating the mobile app with all aspects of your field service business, eFLEXS exploits the potential created by digitalization to connect technology with processes, assets, products, employees and customers. 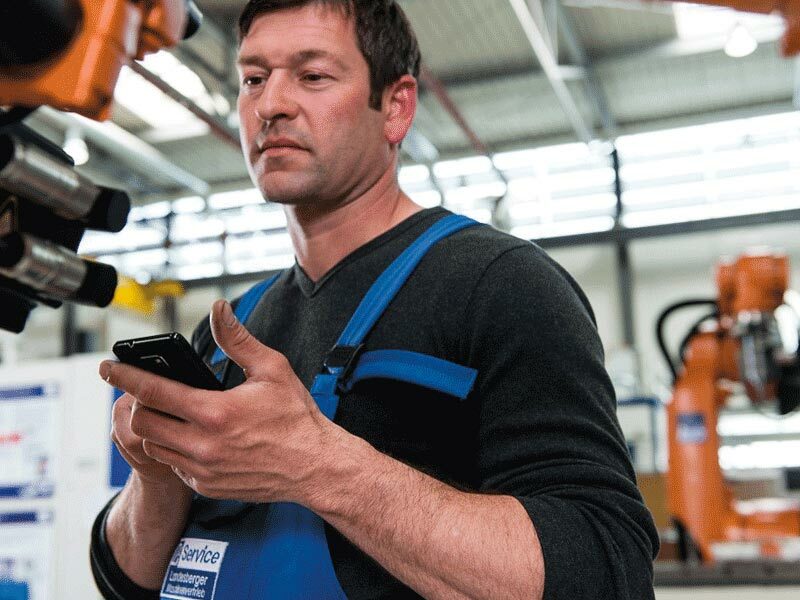 Technicians using traditional work models should rethink their customers’ needs who change because of technological developments and start using a smarter, more productive mobile solution for working in the field. We aim to develop the user interface and functionality of our app with the mobile service technician in mind. The clean user interface always displays relevant information to empower users in the field to concentrate on the real work. See and overview all service activities of your day and easily manage them. 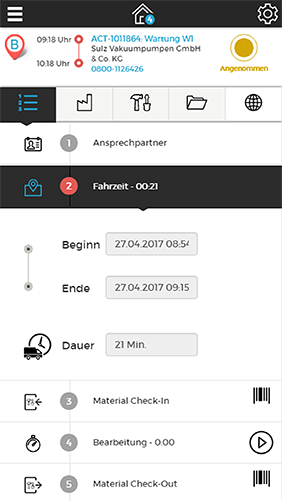 Enter all relevant order data, driving times, working times, service details and more. View attachments of the order to get the job done right or add them for better documentation. Transmit status and data instantly and get everyone in the process informed. Track materials consumption in the order and check your spare parts car-depot level online. Digital reports, automatic emails, e-signature capturing. With just a tap of the screen, eFLEXS field service mobile app helps technicians manage more efficiently their daily tasks and easily access all types of data they need in executing their jobs. Our field mobile app provides the field service technicians a visual and intuitive overview of all service work orders of a day but also a weekly and monthly overview of planned service activities. All important data contained in the service work orders is easily manageable and available at a glance: address, contact person, and contact details. 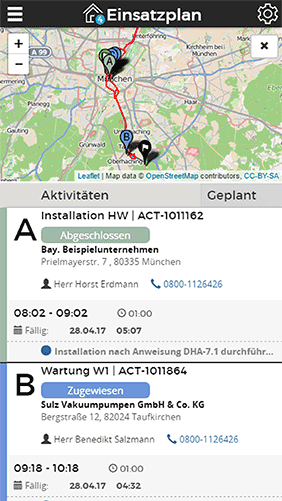 The destinations of the field service missions are visible for technicians and dispatchers in the field service app on a friendly user interface which displays optionally also the map with the respective routes. 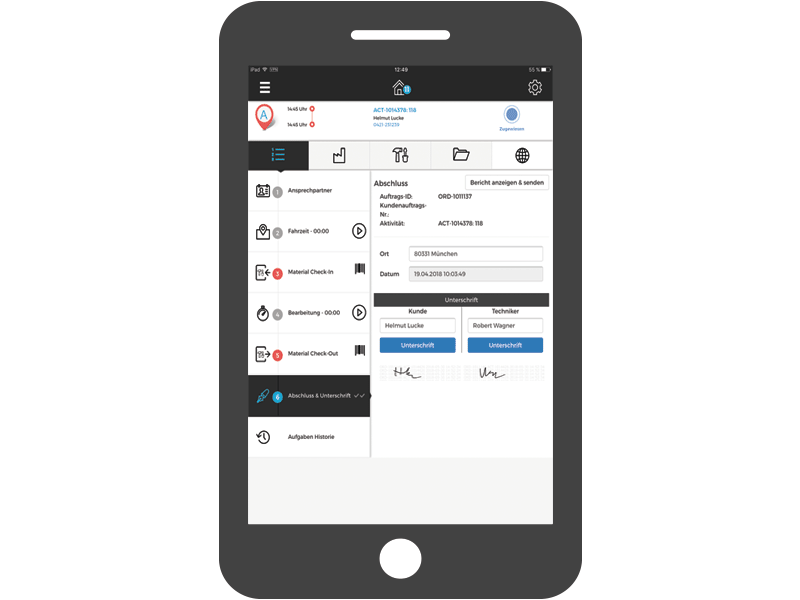 As a hybrid field service mobile application, eFLEXS can be used by service technicians both in online and offline modes. In online mode, the technician has full control over the service activities assigned and he can manage their status easily. The status of each work order is displayed in the technician’s app and directly transmitted into the networked system each time it’s modified. If field technicians have service missions in places without network connection or signal (ex: outdoors in different areas or in basements of buildings without network coverage), it is essential that they can still use the eFLEXS mobile app. Field technicians can capture data about the service work order which is cached offline in the field service app. 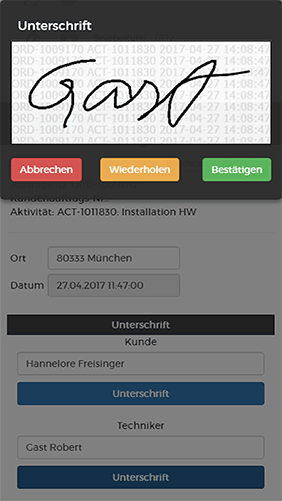 When in online mode, the mobile app transmits and synchronizes the data input by the field technician directly into the system’s database. Going mobile and paperless allows technicians to do the field work in a more productive way. The field technicians maintain and update new information in eFLEXS service mobile app to ensure high-quality documentation. 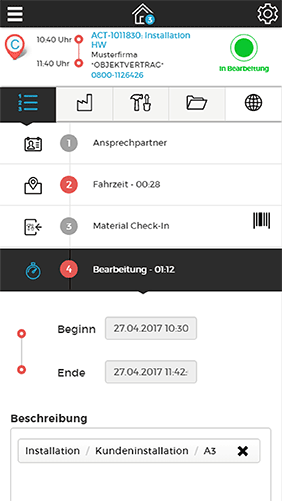 The functionality of adding their own data to service orders allows field technicians to set reminders for anything they need to remember about products or devices within orders (details from customers, data from online catalogs or information received from the dispatcher), keep track of important details and support their work in a smarter digitalized way. In eFLEXS mobile app, technicians can input can input various notes or tags not only to service orders but also to assets thus putting data in relation, that will always be available for the next technician. Inputting data in the mobile field app enables technicians to understand where the data set came from, who else has used it, and how it was used and thus create a networked data that can be trusted. Using eFlexs FSM app, field technicians can pre-allocate spare parts through automatic reservation using the material check-in functionality: mapping of spare parts (object-related data) to service orders. 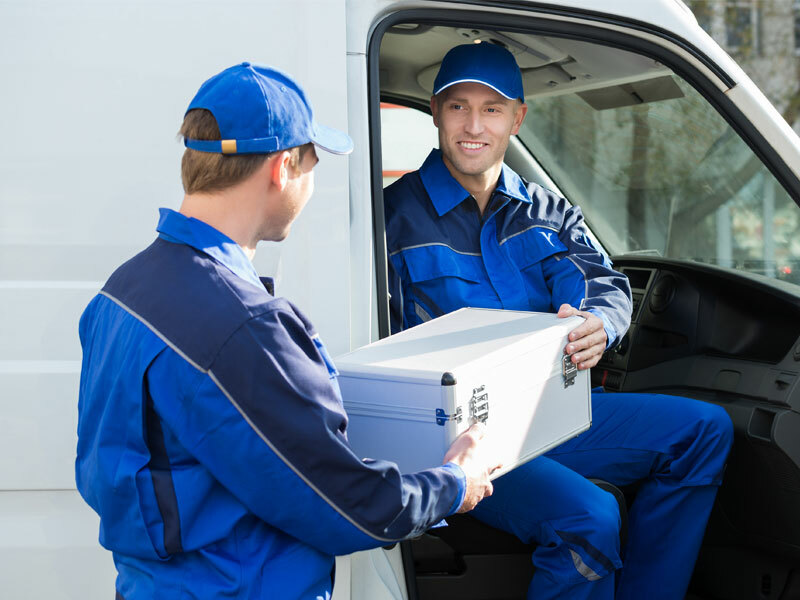 Thus technicians can “prepare” in advance the service order with the materials or spare parts needed, before reaching the clients’ location to make sure they provide excellent service quality. With eFLEXS material management you can prepare and reserve materials in advance to the service execution, search and track the stock level of materials/parts and booking parts/materials consumption from available depots, like the car-depot. By having real-time access to materials data and support on the field, technicians are in control of the job they execute and become more productive in less time. eFLEXS field service app helps you speed up your service operations by accommodating your technicians’ needs to attach to service orders important documents, photos, barcode scans, electronic signatures, and work reports. Adding attachments will provide your technicians with relevant documents on location to better fulfill their job. All these are accessible to technicians, dispatchers and customers from anywhere right when they need it no matter the device they use. The attachment function makes technicians work easier by capturing real-time aggregated data available also for the next coming technicians in the FSM app. Siloed data is reduced by sharing one’s own work and data in the activity and strengthening trust and solidarity within the technicians and company. Create, share, and collaborate on custom online service work reports that are easily built and updated automatically in real-time so that everyone in your organization is working with the same information: technicians, customers, managers. Service work reports are created with just a few clicks in the FSM app and sent automatically by email to customers. All details of the service orders including electronic signatures (technician’s and customer’s signature) that are captured on the mobile devices are displayed in the work reports and accessible anytime. Map view with GPS positions of the planned service work orders and routes. Real-time information available about technicians' location and all service. Take photos and attach or send easily documents with a single tap. 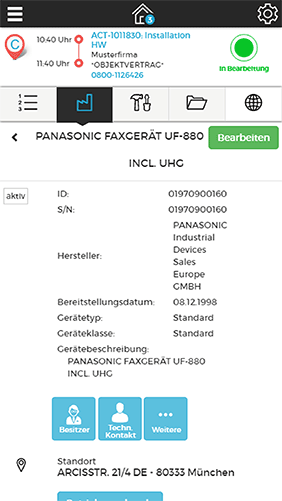 Identify parts from an online catalog or a physical item with a barcode. eFLEXS mobile field service app is multi-device and multi-OS. Do your service activities in the field without interruption, even if a network connection is not available.